Please schedule an appointment with us before meeting our travel specialists or visa expert at our office. Specializing in adoption travel for more than a decade, Lotus Travel is devoted to helping Chinese orphans find permanent loving homes, ease the stress of adoptive families during last-minute travel planning, offer meaningful and memorable homeland heritage tours, and introduce the authentic and inspiring Chinese culture to families and friends with children from China. 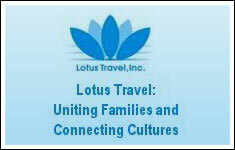 Lotus Travel is a terrific group of people! Please contact them regarding adoption travel and homeland tours! ADORE coordinates humanitarian aid services in The Republic of Georgia and provides our contacts for providing aid in this country. We’re happy to partner with this wonderful organization to help the children of Georgia.